“The (Afghan) Taliban regime cannot be termed a model Islamic government, as little of what they did was Islamic." Tehrik-e-Taliban Pakistan's "Jihad" inside Pakistan is fasad"
The above quotes are from various interviews and speeches of courageous and straight-talking Jamat-e-Isalmi Chief Qazi Hussain Ahmed (1938-2013) who passed away a year ago. Qazi sahib's honest criticism of the Taliban's terror drew the wrath of the late TTP Chief Hakimullah Mehsud. He was targeted in a suicide bomb attack which he luckily survived in November 2012. Unfortunately, he only lived for less than two months before suffering the fatal heart attack on January 6, 2013. May Allah reward him for his many good deeds, including his clarity of thought, extraordinary integrity and undeniable bravery to speak the truth in the face of danger. Regardless of political or ideological differences one might have with Qazi Sahib, it is hard to question his courage and integrity. Such qualities are fast disappearing among the current crop of Pakistani leaders, particularly the right-wing Islamist leadership which is either complicit with or afraid of the Taliban terrorists. Qazi Sahib's successor Munawar Hasan has been the biggest disappointment in this regard. Current JI Chief Munawwar Hasan has taken the outrageous position of calling the dead TTP Chief Hakimullah Mehsud a shaheed (martyr). Rather than condemning the TTP, he has expressed solidarity with them. He has said, "we are one with the TTP (hum aik hi ikai hain)". Adding insult to injury, he went to say that the Pakistani soldiers who have been killed in the TTP attacks are "not shaheed". Imran Khan, whose party PTI is in coalition with Munawwar Hasan's JI, has refused to condemn the Tehrik-e-Taliban Pakistan (TTP) by name. In fact, PTI has diverted attention from TTP terror by turning the nation's focus on US drone strikes since the TTP leader Hakimullah Mehsud was killed in one such strike last year. Maulana Fazl ur Rehman, the leader of Jamiat Ulema Islam (JUI-F) and former ally of JI in MMA coalition, has offered his own logic explaining why he thinks Hakimullah Mehsud is "shaheed". "Even a dog killed in any US drone attack is shaheed", he added. 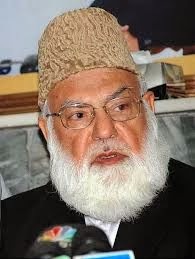 I hope the first anniversary of Qazi Husain Ahmad's death serves as a reminder to Pakistan's politicians for the need of clarity of thought, courage and integrity that the departed JI leader had. Only then can Pakistan deal honestly and bravely with the difficult challenge of terrorism that is becoming an existential threat. Shaheed debate; Ashoora; India’s absence in Commonwealth meeting from WBT TV on Vimeo. But But Mr.Haq sahib,don't you know Islamists are EVVILLL incarnate, don't you know they have killed millions of people..oh wait those were secular regimes(pol pot,stalin,europe during ww1 and ww2 etc). Interesting fact, a undergrade of philsopy from my university (york university Canada)did a interesting survey. He counted the body count of all the people died in the name of relgions, both historcal and legend(Noah flood,mahabaratha etc) and found that a wooping 800 million people died in regliions conflict in the past tend thousand years, guess how many people he found killed my secular governments in the past 100 years, 250 millions. 800 million in 10000 years vs 250 million in 100 years.